MailChimp is an immensely popular email list management service. The unique subscriber profile feature of the service allows you to get close with your subscribers. The powerful automation system enables you to schedule emails. You can choose any of the existing email templates or edit them. There are lots of detailed analytic reports available for tracking and analyzing your email marketing efforts. The powerful application also features seamless integration with the popular third-party services including CRM, CMS and e-commerce platforms. Let’s take a look at the pros and cons of MailChimp. Entrepreneur: Free for lifetime. Allows sending 12,000 emails to 2,000 subscribers per month. Growing business: Starts from $15 per month for up to 1,000 users. Unlimited emails. High volume sender: Starts from $2450 per month for up to 552,500 users. Up to 6,630,000 emails. 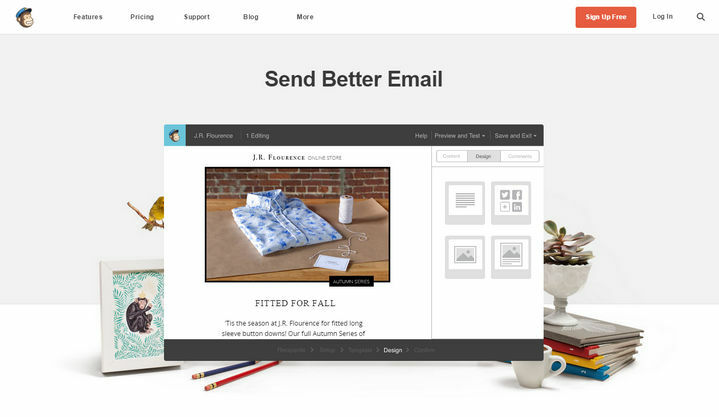 The simple user interface of MailChimp makes it very easy for anyone. If you are only getting started with email marketing, you can obviously start your campaign with a free MailChimp account. However, if you are looking for more sophisticated options, you may consider other services. Some popular alternatives to MailChimp include AWeber, GetResponse and Mad Mini. MailChimp offers all the necessary features for starting your email marketing campaign. The helpful reporting features and the fully customizable email templates make the whole process simple for any level of user. The lifetime free plan makes it a lot more attractive.